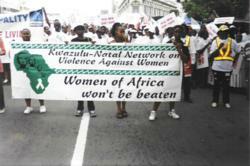 Wentworth, South Africa (PRWEB) July 30, 2012 – Over a thousand community members and stakeholders from across the eThekwini Municipality gathered on July 8 to commemorate the first community-initiated Violence Free Zone. Launching in the suburb of Wentworth, the zone represents community-driven action to prevent gender-based violence, and has inspired the set-up of further Violence Free Zones across the district. The concept of Violence Free Zones came from partners Prevention in Action and Brothers for Life Wentworth to mobilize the local community to shift their response to violence from inaction to one of prevention, driven through community action. PIA is part of a community-led social mobilization program to prevent violence against women and other forms of gender-based violence. In operation since 2009, it has been implemented by the KwaZulu-Natal Network on Violence Against Women (VAW), together with PCI (Project Concern International), and public sector partners. A main goal of this four-year program is to reduce HIV transmission by changing social norms related to reducing gender-based violence. Funding has been provided by the U.S President’s Emergency Plan for AIDS Relief (PEPFAR), the United States Agency for International Development (USAID) and FHI360. Engaging 12 civil society and public sector partners to roll out the community mobilization activities, the program trained over 100 individuals as Community Engagers who reached over 12,000 community influencers by the end of 2011. Full program results will be published as it concludes in late 2012. Hosted by the Prevention in Action social movement and Wentworth Brothers for Life chapter (developers of the zones) the celebration was supported by a number of Wentworth community partners including the Wentworth SAPS, Wentworth Taxi Association. The event was also attended by representatives from the KwaZulu-Natal Premier’s Office and from the U.S. Government. The celebration also included the launch of another aspect of the campaign, ‘Taxi Talk”, created in collaboration with the Wentworth Taxi Association. Taxi Talk includes 70 branded taxis that will play music from the platinum selling artist, JAE, with lyrics carrying key messages around the prevention of violence against women. Celebrating its 50th anniversary in 2011, PCI (Project Concern International) is an international health, development and humanitarian assistance organization, operating in 16 countries worldwide. PCI is dedicated to saving lives and building healthy communities around the globe, benefitting over 6.7 million people annually in Asia, Africa and the Americas. Funded by federal grants and private support, PCI’s current annual budget is nearly $50 million and the organization has 600 employees worldwide. PCI’s headquarters are located in San Diego, CA and also has an office in Washington, DC and a Seattle, WA representative.